We are one of the largest companies in the state for pushing finish grade topsoil. We efficiently topsoil, seed, fertilize and mulch. 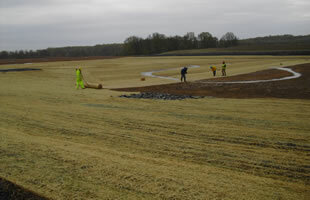 We are proficient at planting wetland plugs, native plants and trees that can survive damp and wet areas – in some cases planting a half of a million wetland and native plugs. Further, we work on rehabilitating contaminated areas, redeveloping land areas and increasing landfill capacity. Aspen’s Equipment meets NJ and NY EPA, DEP standards.